Also: The below post is buy Phil Dunn, an eBay Marketing author and frequent contributor to the eBayInc.com blog. Phil interviewed me and then gave me permission to post his finished article below. Jordan Malik is one of the masters at this game, and he’s got a few tips that even casual sellers can use to save money on purchases that they can resell on Amazon or back on eBay. If you want to dig deeper into 'Buying Low to Sell High" check out his ebook on the topic here. 1.) 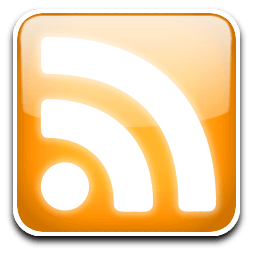 Use the free service IFTTT.com to find deals: IFTTT stands for “If This Then That”. Basically it’s an easy to use, do it yourself product alert service. 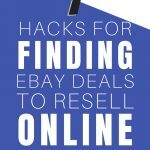 There are lots of eBay ‘recipes’ that are ready for you to use within IFTTT, but this is a good one to boost sourcing success, according to Malik. Lifehacker also has a good article on the subject here. Once you have the IFTTT set up, you receive text messages whenever your search criteria turn up a new eBay listing, so you can pounce on the item for sale. Pretty slick. 2.) Save your searches with a simple bookmark: “I’ll do a search for an item on eBay, sort by newest listing, and exclude (in the results) non-U.S. countries so I know I won't be hit with considerable shipping charges,” said Malik. “Then I bookmark it so I can always come back to that targeted search.” Sorting by newest listing is important. This allows you to see items as they’re listed and get a jump on other bidders. It’s especially useful for buy it now (BIN) bargains. 3.) Use Malik’s free CleerPro.com browser extention to find comparative pricing info: With just a couple of clicks, you can find pricing info from all over the web (Amazon, CamelCamelCamel, eBay and more). I like the right click-feature that allows you to highlight a product name or (for books) UPC number, right click your mouse, and get right into the pricing info immediately. 6.) Look for auctions that end at weird hours: “Look for items where the auction ends when people are sleeping,” said Malik. If you target U.S. auctions that end from 1:00 AM to 7:00 AM EST, you’ll find some. “This usually decreases demand for that auction,” said Malik. “The 'sold' auction price can be far less than the true market value of the item.” If you go into advanced search, you can adjust the ending times to find auctions that are ending at the time of morning you choose. 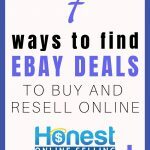 With these tips and a little practice, you can find eBay bargains that fit nicely among your online product sourcing methods. Best of all, it’s faster than hopping in the car and driving to the local mall. I have found some sweet deals, buying and reselling but sadly its getting harder. Great article, it still amazes me how much cash can be made flipping from Ebay to Amazon. Just recently found an Amazon best seller selling in bulk everyday for half the price on Ebay!